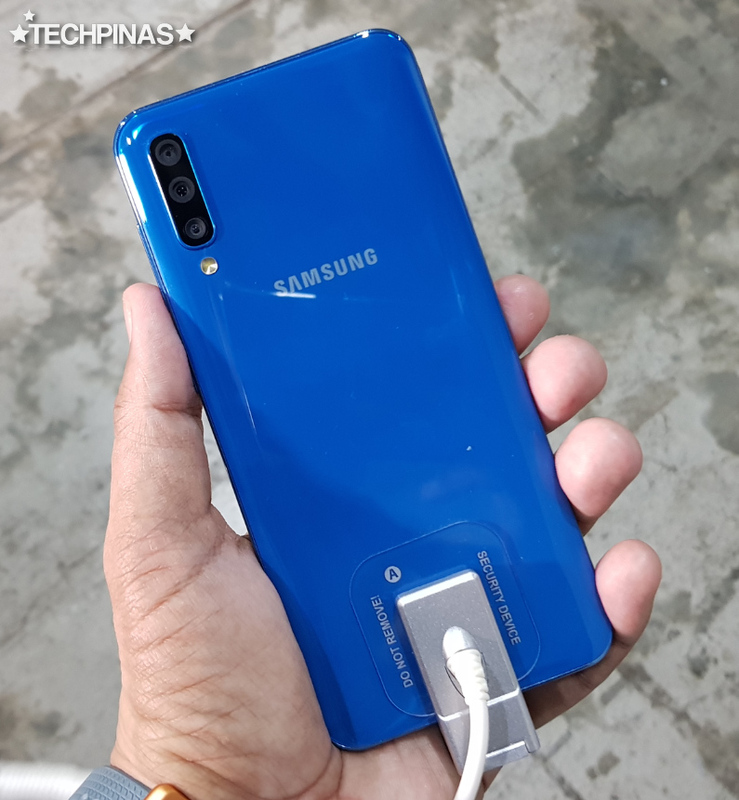 Today - Saturday, March 30, 2019 - is the official release date of the much anticipated Samsung Galaxy A50 here in the Philippines. As I've shared in a previous post, this model is the Korean Giant's latest effort to make its midrange smartphone category more exciting and attractive to consumers who are now planning to upgrade from their entry-level or aging handset to an updated higher tier device. Over the past few days, I've been receiving many questions from my readers about this mid-level release. One of which is how the Blue version looks in the flesh -- as I have already shared photos of the White variant in my earlier blog entry. If you're one of those who sent me that inquiry, this post is for you. 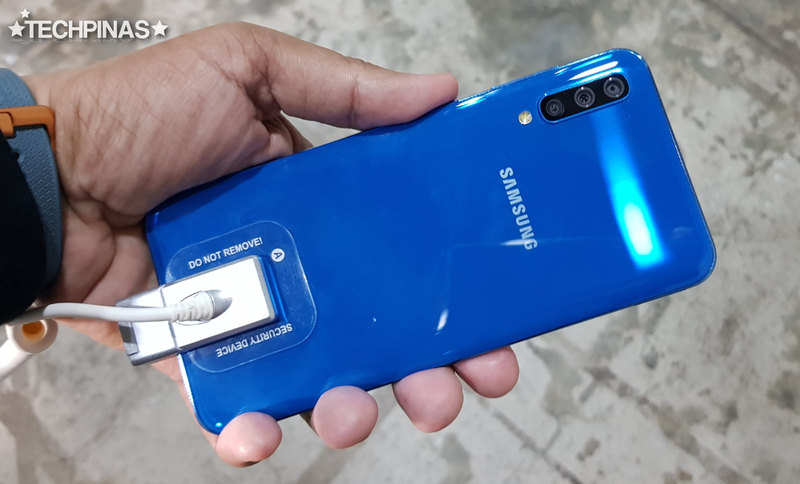 Here are my actual unit photos of the Samsung Galaxy A50 in Blue. Upon launch, Samsung Galaxy A50 is available in three colors, namely Blue, White, and Black. All of them feature a 6.4-inch FullHD+ Display with U-shaped Notch - housing 25 MegaPixel f/2.0 selfie shooter - and ultra-slim black bezels. 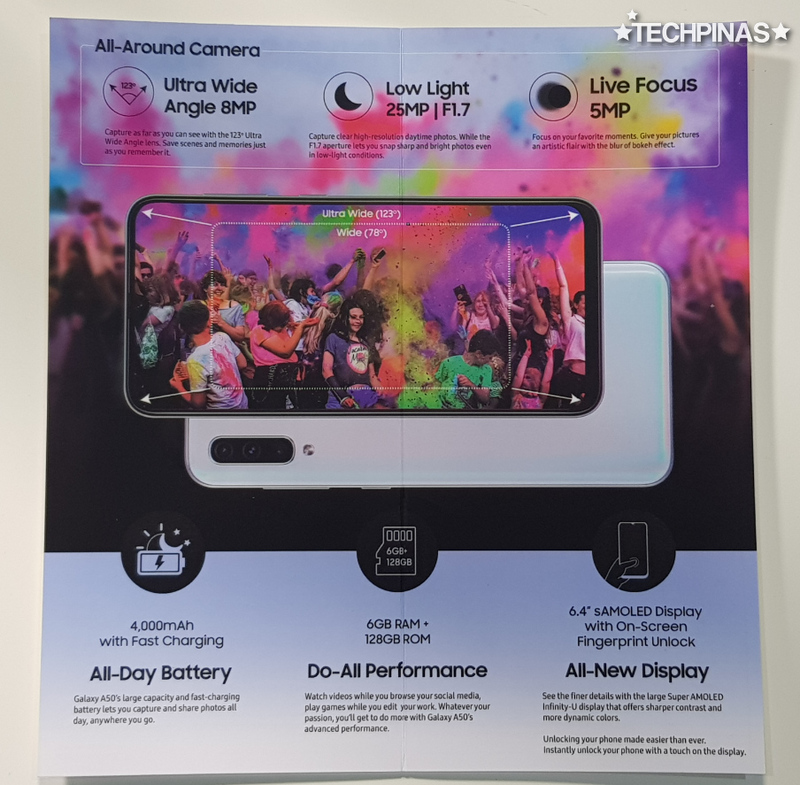 At the back, the Galaxy A50 has a Triple Rear Camera set-up consisting of a 25 MegaPixel primary cam with standard field of view and f/1.7 aperture for good low light performance, a secondary 8 MegaPixel snapper with Ultra-Wide lens for capturing group photos and landscape shots, and a tertiary 5 MegaPixel Depth Sensor enabling Live Focus mode for adding Bokeh Effect to portrait or food shots. 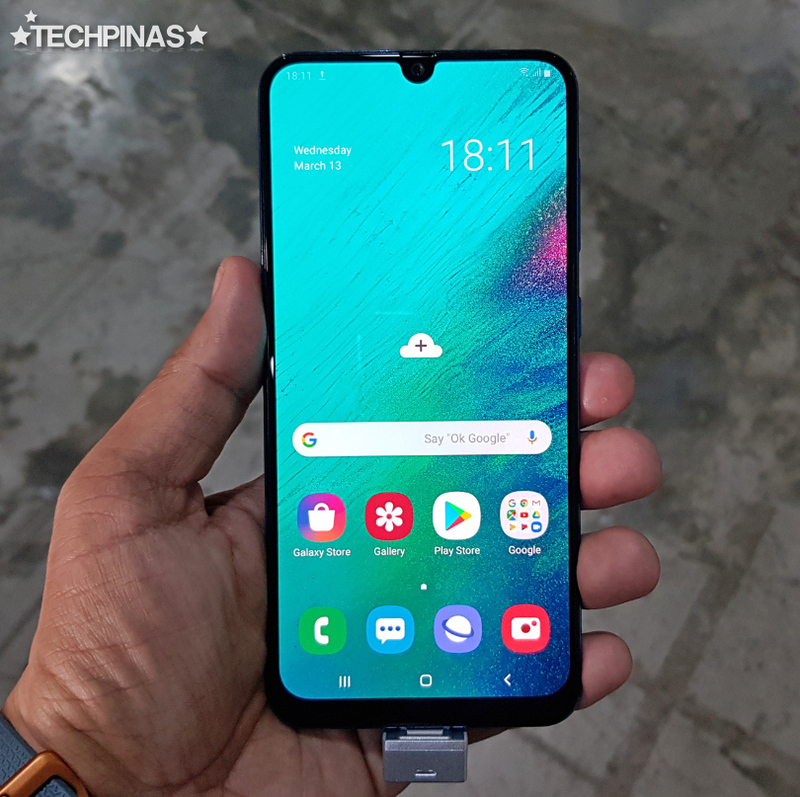 Inside the phone's sleek high-gloss exterior, Samsung Galaxy A50 runs its One UI customized Android 9.0 Pie OS with a powerful and energy efficient 10nm Exynos 9610 Octa chipset that incorporates a Mali-G72 MP3 GPU for smooth mobile gaming experience. The chipset is complemented by 6GB of RAM for stutter-free multitasking and 128GB of internal storage, which should be large enough for all of your photos, videos, and other large files. However, in case you need more space, you can always utilize the dedicated microSD card slot. 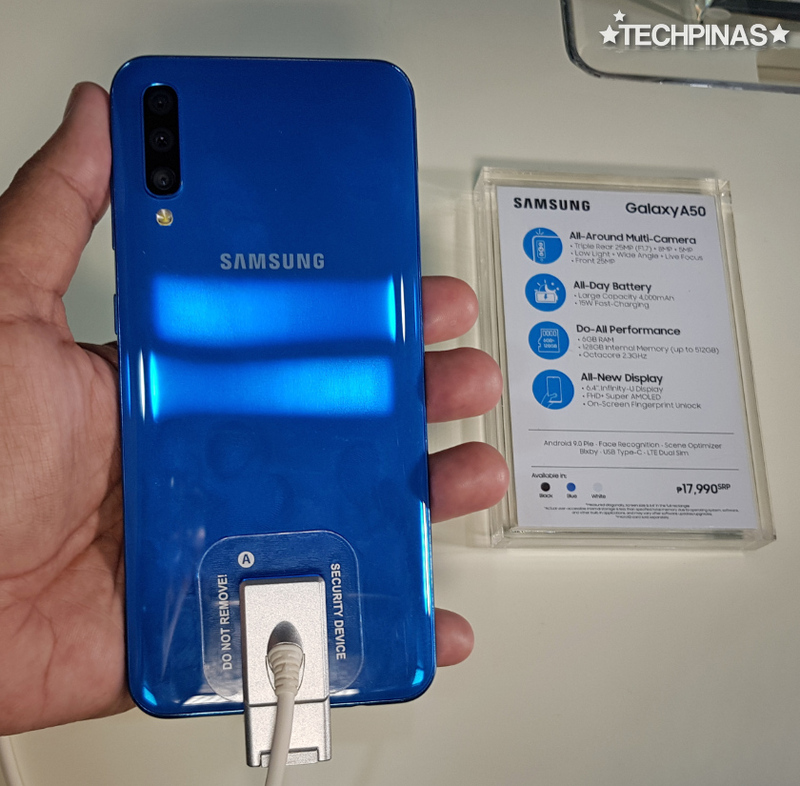 Despite measuring only 7.7 millimeters at its thickest point and weighing just 166 grams, Galaxy A50 - surprisingly enough - has a rather large 4,000 mAh Li-Po battery pack that ensures at least a whole day of uptime with regular use. This battery even supports 15W fast charging you won't have to spend too much time plugging it to an electrical outlet or powerbank. 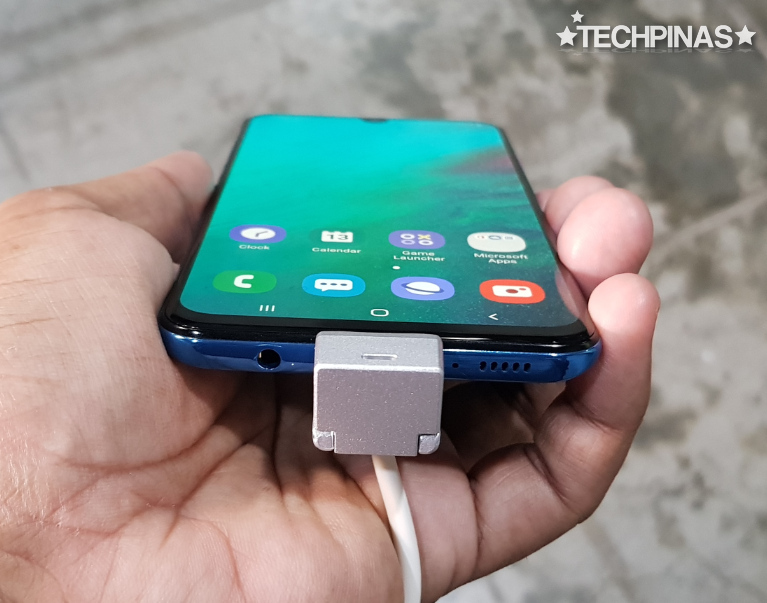 Speaking of charging, Samsung Galaxy A50 features a USB Type C port at the bottom, which supports faster data transfer when you connect the phone to a laptop or computer. This definitely comes in handy when you have to transfer your photos and videos to free up the handset's internal storage space. Jumping back to the cameras, the Galaxy A50's front cam is powered by Samsung's own beautification software which automatically evens our your skin tone in selfies so you can instantly share them on Facebook or Instagram. As for the Triple Rear Cam, the primary shooter feature's the Korean Giant's Scene Optimizer which intelligently figures out the subject in front of the lens and tweaks shadows, highlights, and saturation among other elements to deliver the best image possible. Some of the scenes that can be recognized include people, sky, greenery, food, and even pets. Samsung Galaxy A50 is one of the first handsets from the company to sport an Infinity U SuperAMOLED display, which is renowned for its brilliance and energy efficiency. The name of the screen is based on the U-shaped notch where you'll find the front-facing camera. I know some of you hate the notch -- but at least, the Galaxy A50's notch is not as wide as that of the iPhone or Android smartphones from 2018 with this display feature. 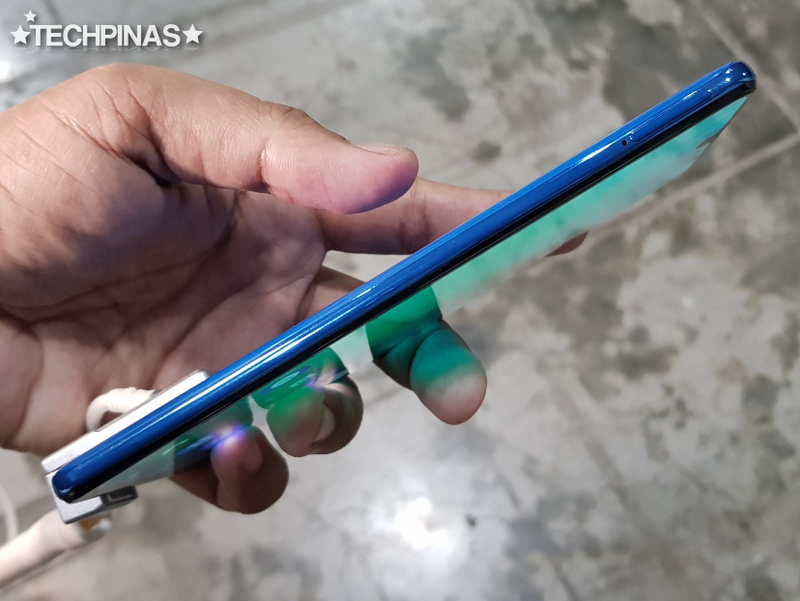 Going back to the design and color, I'm not sure if you can see it in these photos -- but the Samsung Galaxy A50 Blue variant has a beautiful sheen that reminds me of a pearl finish. 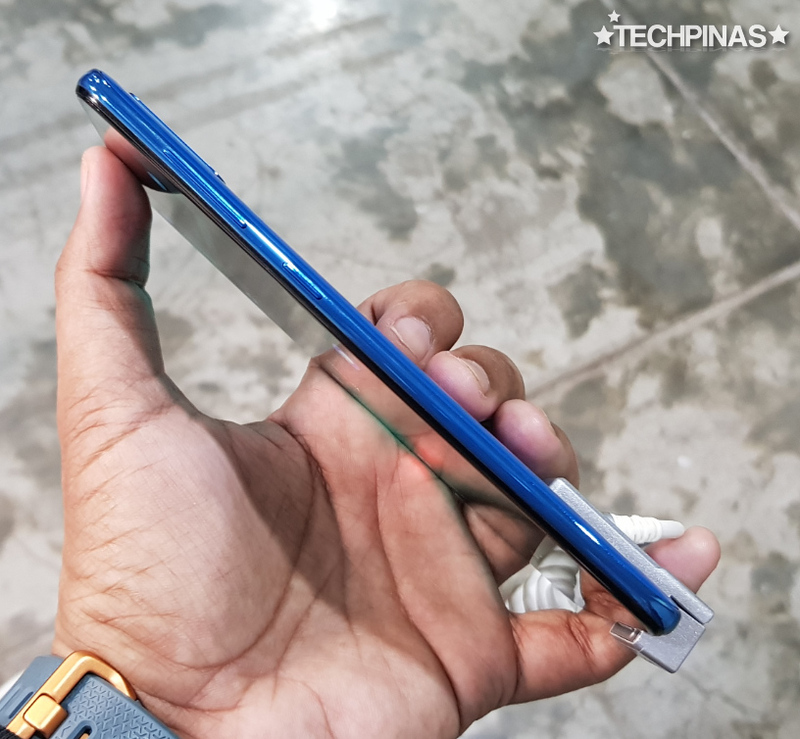 This unique finish gives the device a deeper shade of blue when there's little ambient light and a lighter, more striking tone when you're using the phone under direct sunlight or when there's ample lighting. Interested in this model? 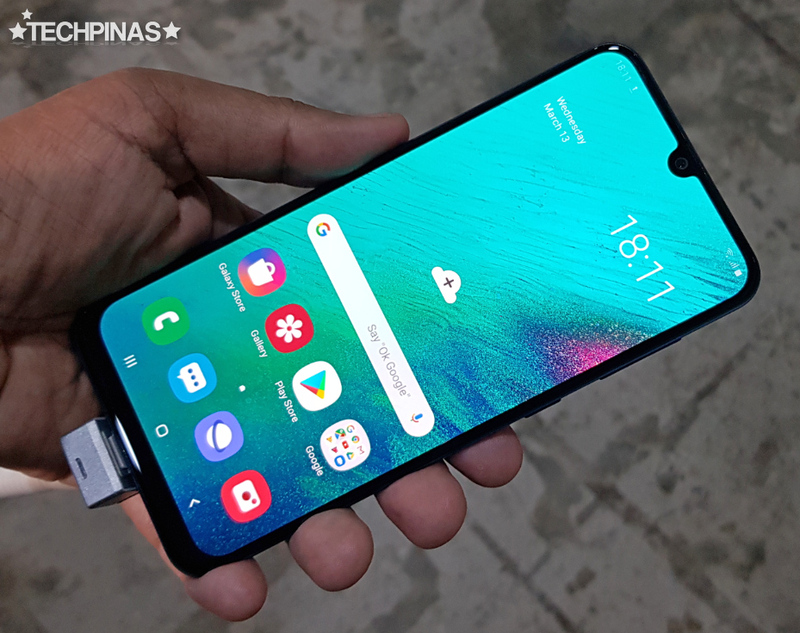 Samsung Galaxy A50 is now available at all concept stores and authorized retail partners of the Korean Giant in malls across the Philippines and even online for PHP 17,990.